2009 AKIRA SEIKI SR3-VP CNC VMC, 16 ATC, 40 TAPER, AKIRA Mi 645 CONTROL, 11,000 RPM, S/N V07080350. 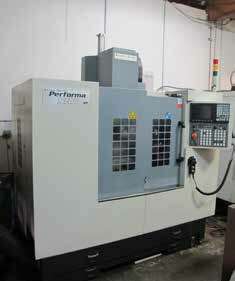 2007 AKIRA SEIKI PERFORMA V3-C CNC VMC, 40 TAPER, 22 ATC, MITS CONTROL, S/N DUD741-706. 2004 HURCO VM-1 CNC VMC, 8000 RPM, 16 ATC, SWING ARM, S/N 06001103EA. 1994 FADAL VMC-40 CNC VMC, 21 ATC, CT-40. 2) SHIZOUKA AN-S CNC MILLS, WITH BANDIT CONTROL, ATC. HARDINGE HLV-H TOOL ROOM LATHE W/ INCH AND METRIC TRREADING. HARDINGE HLV-H TOOL ROOM LATHE W/ THREADING AND DRO. HARDING DV-59 2ND OP LATHE. 3) BRIDGEPORT VERTICAL MILLS WITH, 2HP, DRO AND P.F. BOYAR SCHULZ 6 X 12 SURFACE GRINDER. DO ALL 18’’ VERTICAL BAND SAW W BLADE WELDER. ATLAS COPCO 10 HP ROTARY AIR COMPRESSOR. LARGE SELECTION OF TOOL HOLDERS, VISES, TOOLING, CUTTING TOOLS, INSPECTION TOOLS, AND SUPPORT.